It’s tempting to think that the benefits of new technology come from plugging in whatever is new and has been shown to work. We’ve all seen the articles about the possibilities of data, machine learning, blockchains or mobile apps. The truth is, the benefit comes not from the technologies themselves, but from how and why they are applied. Better understanding your customer, creating better products, improving supply chains and harnessing new business models are all technology neutral goals. Research conducted by the Chair in Digital Economy at QUT, in partnership with KJR, The Department of Science, Information Technology and Innovation, and Isobar Australia, shows that most businesses have the ability to apply technology in ways that improve their products or services. This doesn’t mean they must produce their own technology in-house. Successful companies also come up with novel applications of existing technology. Either way, it takes vision, a strategy to get there, leadership, a skilled workforce, and, to bring it all together, a culture that embraces change. Take Netflix, for example. This is a company that started out in 1997 mailing DVDs to customers in North America. Ten years later, Netflix introduced its streaming service and is now in almost two hundred countries. This is a shift that completely changed both Netflix’s product and business model, requiring an entirely different set of competencies. Such change required a particular mix of insight, problem solving and daring. It identified the threat of a changing market and disrupted its own business to stay on top. Netflix wasn’t the first to offer movies online. And it didn’t just slap streaming on top of what it already had. What made Netflix successful was the way it applied the technology to its particular problem, and how it built an entirely new business around it. What continues to make Netflix stand out is how proactive it is. Not content with being a dumb pipe for other companies’ shows and movies, Netflix uses the data generated by its audience to commission original shows and movies, and to tweak its recommendation algorithm and platform, making its offering unique. This is a virtuous cycle. As Netflix’s technology improves so does its customer proposition, it spreads its costs over more customers and reaps more revenue and data to feed back into the system. The application of technology is an ongoing process and tied into every aspect of the business. As the Netflix example shows, creating a successful digital business requires something like an organisational shift. In fact, research has identified a number of common features among the most successful digital businesses — the “digitally mature” companies. These companies have a clear vision for what they want to achieve, an idea of how technology fits and a strategy for how to get there. They tend to be problem and customer focused, and have empowered employees with the technical skills to find and implement solutions. Bringing all of this together is a culture of continuous improvement. Netflix holds regular “hack days”, for instance, to test new ideas and technologies, and improve internal processes. It hasn’t yet launched a virtual reality product, but it has been experimenting with it for years. Activities like these empower employees to experiment, have ownership of problems and take risks. Of course, most businesses will exist on a continuum somewhere between digitally immature and what Netflix has accomplished. But building the internal capability of a digitally mature company can be accomplished incrementally. 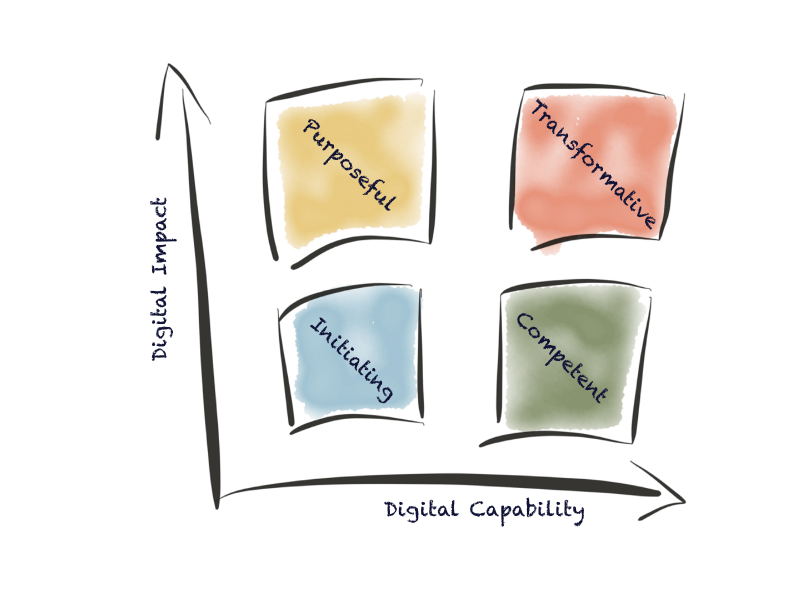 The first step is assessing the digital capability of the firm, in terms of strategy, skills, infrastructure, risk management, customer experience and business model. Setting out vision for what the business hopes to accomplish can help you see the problems and opportunities. Start to build a strategy for how to get there, and how technology can be used to transform the entire business rather than a particular silo. Use this to empower and build the competencies of staff, risk management, decision making processes, and the necessary infrastructure. To find a checklist for Digital Maturity and read the full report this article was based on click here.